we’ve made a grid kit. 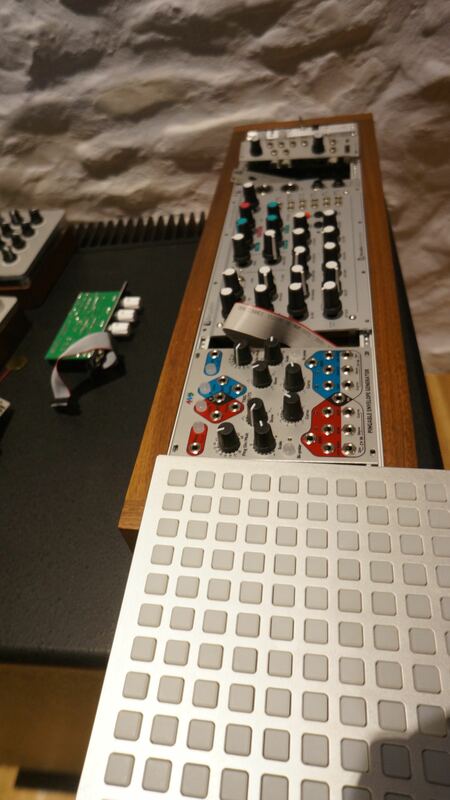 it has the newest electronics from the current 128, meaning it’ll be perfect for our eurorack modules. the kit includes a milled faceplate and laser-cut bottom plate, ready to play after some assembly (no programming required). surface mount soldering is required (leds and diodes). you choose and source your own LED. there's a full guide with suggestions at monome.org/docs/gridkit. this is limited edition. we will not be making this kit as an ongoing product. Oh well, I had not planned on saving any money next year. i might add-- with everything included, you really don't need a case. sure, the sides are open, but it's really thin. you could effectively wrap the edge with gaff tape and it'd be "fully enclosed" and very sturdy. These look great Tehn, time to upgrade! PS does this come with a USB cable or is that separate, I see it's the mini socket instead of the old B jacks. under $15 for orange matching our euro modules. see the assembly guide for a bunch of part links. we're only selling these direct. thinking out loud here but, the faceplate miiiiight just sit proud... or will the PCB underside hit the sides? thought you were permenantly abandoning kits, glad to see this! ordered! any expected ship date? was thinking of selling my mk128 and getting one of these. idea of the number of kits you are/have/will make? It's not for 3U awaiting.deletion...maybe 4U, def 5U. best as a tabletop or laptop design anyways. I'm getting one with the intention of building and evaluating my choices: keep both or sell one. I don't know which way i would lean, but I'll get back to you if it's not too late to order. shipping tonight. (drop off tomorrow at post office). edition of just under 100.
placed an order. @tehn, one question - is USPS international shipping trackable? edit: nevermind, just noted the "shipping via USPS priority" subscript in the description. the basic orange (from last edition) are good an not expensive. but it's an opportunity to make something custom, so hey. The 12-step recovery process can vary depending on the group you join in. However, the original 12 steps as developed by Monome Anonymous are quoted in full below: We admitted we were powerless over grids -- that our lives had become unmanageable. We all want aleph's but are powerless until the second coming !!! Tehn, could you let me know the shipping cost to the UK please. I can't seem to access it without going through the order procedure. Many thanks. Also, if I order two is the shipping cost doubled or combined? Thanks again. Are you going to make the walnut enclosure drawing file available ? no shipping combining unfortunately, we're shipping flat-rate via usps priority. leds ordered too, this is starting to feel really exciting. @tehn, when is the next round of shipping happening? will you be sending out tracking infos for the parcels? no, we don't have an enclosure file to release. evidently i have to ship in-person at the post office to russia? headed over now. tracking yes. never heard about sending things to russia in person, must be some new usps regulations. hopefully that won't be of much trouble to you. and thanks for bringing the kits back, i really couldn't resist getting one, esp. at that price! How does this compare sizewise to the mk kit? Is it basically the same grid size or smaller? same as production 128 grids. not mk. There is a connector on the pcb that seems to be unused... ADC's by chance? no. that's the programmer port. mine seems to be receiving button presses and all LEDs fire fine. occasionally i am getting a row of 4 lighting up at maybe 35/50%. sometimes these are associated with a button i'm pressing, other times it's not. any ideas? thanks! i've been sketching out ideas for 32x8 grids (ie two 128s together) which is kind of incredible. just need to find an uninterrupted week to get my head around building standalone applications.... errrr.. one day!